Members of Stop Deep Sea Oil flotilla off East Cape, Tuesday April 12, 2011. Photo: Greenpeace/Malcolm Pullman. The Oil Free Seas flotilla will confront a Texan oil company’s drilling ship over 100 nautical miles off the North Island’s west coast in the coming weeks. The flotilla, made up of seven boats, is a loose association of individuals and boat owners who oppose deep-sea drilling and the new legislation that takes away New Zealanders’ long-standing right to peacefully protest at sea. One of the boats taking part, the Vega, also sailed against French nuclear tests in the Pacific. “We love New Zealand, and this country is what it is because kiwis have stood up for what we believe in. 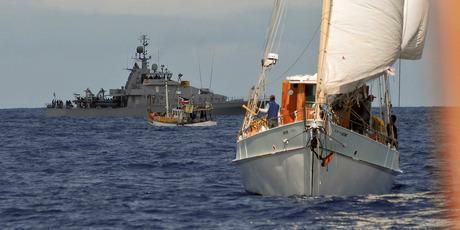 I was on board the SV Vega protesting against French nuclear testing in the Pacific in the 70s. Nuclear testing in the Pacific wasn’t right and deep-sea oil drilling in the Tasman is not right either. We will not be bullied into submission by big oil or dubious laws,” said Anna Horne of Oil Free Seas Flotilla. “By being there we are saying to Anadarko that they are not welcome here doing this kind of activity. This law suits the suits, but not the environment and the wishes of the people of New Zealand,” says Horne.